The "6 Inch Polypedic" is the rare cheap mattress model that offers both comfort and support at a low cost. It features a quilted cover and feels like one of the better futon mattresses out there. This is also a great option for bunk beds or any other kind of bed that requires a mattress that isn't too thick. Symbol Mattress manufactures this model in the USA and it is made from CertiPUR-US foams. Perfect for kids or for a short-term solution for adults. 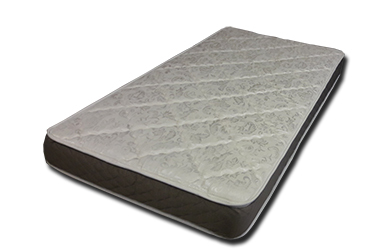 For short term use for an adult or longer usage for kids, the "6 Inch Polypedic" foam mattress is a great option. Oftentimes, customers prefer it over the very low cost spring models and frequently use them for a cheap solution for spare rooms and visitors. Its level of support is great and I'd recommend it for the aforementioned purposes.